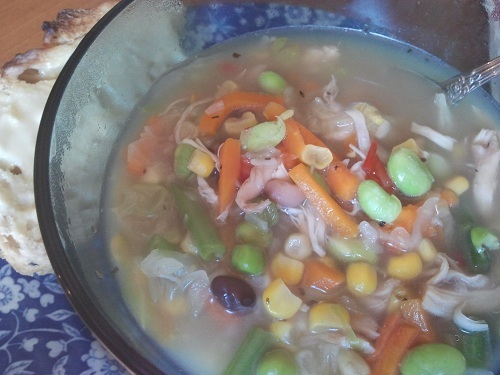 Chicken soup is an easy meal to produce at home, yet few people I know are soup makers! A pot of simmering soup fills your home with a delightful aroma, offers a healthy dinner meal, healthy lunch meals for the week, ends the fast food habit, and saves money! To simplify the process, purchase a rotisserie chicken. The process could not be easier! I purchase a rotisserie chicken once a week. I pull half of the meat off for a dinner meal, usually a chicken stir fry. While we are eating, I simmer a large soup pot with water and my remaining chicken for about a half an hour. When I'm done, I pull the chicken out to cool a bit, debone the meat, add it back to the pot, and then refrigerate it for next day use! Since its quick soup, I use Trader Joe's frozen organic vegetables! You can use fresh vegetables and when I have time I do, but quick meals make fast food less tempting, and it's just nice to know all day that a quick meal is ready to go at home. Boil 1/2 to a whole rotisserie chicken in a large soup pot full of water for 1/2 an hour. Remove the chicken, debone the meat, and return it to the soup pot. Add all of the remaining ingredients to the pot. Boil the pot until the tortellini and the vegetables are tender. Top with chopped parsley or basil if you have them! This chicken soup meal is great served with a salad or just a chunk of hearty toasted bread! Its filling and not a lot of kitchen cleanup afterwards! I always portion out the remaining soup into lunch portions for grab and go lunches. 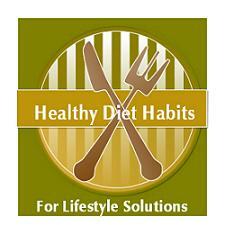 This one healthy diet habit has saved us money and my husband has lost 10 pounds by ditching his lunch fast food habit! A pot of soup a week is great for weight control, weight loss, and frugal living! If you make your soup on Monday, you are set for the week!